Posted on September 30, 2014 at 10:00:18 am by Mike F.
Folks who live in Fort Wayne, Indiana, have a lot to be proud of, not the least of which is our amazing park system. My favorite park – and honestly, my favorite place in the city – is Lions Park. One of the city’s many neighborhood parks, you can find it at the intersection of Carew Street and Hazelwood Avenue, not far from Coliseum Boulevard. It’s a suburban oasis of fields, trees, and a lot of great memories. Lions Park was a two-minute bike ride from the house I grew up in, so you can imagine I spent a lot of time there as a kid. My first real memory of the park is from a kindergarten field trip my class took there. It was a gloomy day, much like the day I’m writing this post, and I remember riding the merry-go-round and then…not. Yup, I fell off and got caught underneath. Luckily, I wasn’t hurt, so this can stay filed under (relatively) good memories. As I got older, I still spent a lot of time at Lions Park. My friend Kyle and I would spend hours there in high school, listening to R.E.M. and Counting Crows and talking about comics and video games and zombies. When I told my wife I was going to write this post, she reminded me we had our first non-date there (I was actually interested in her friend), and I remember someone getting smacked by a tree limb (one of the girls, if memory serves). Even into college, my friends and I hung out there, usually after dark, even though the park closed at dusk (I was a rebel, I know). It was a quiet place we could all just sit and talk. Today, I work close by and often take my lunch at the park. I can always head over after work, too, to shoot some hoops or practice my tennis swing. What else is there to do at Lions Park? 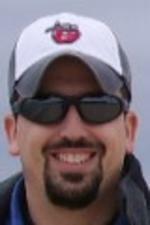 There’s a baseball diamond where I’ve played a bunch of softball games. 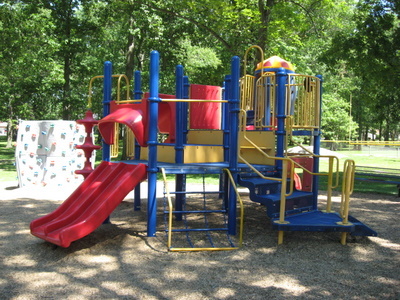 There’s a playground with lots of things for kids to do. There’s a pavilion for picnics, family reunions, and work outings. 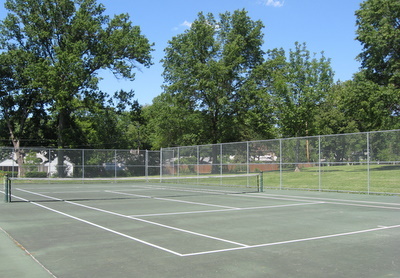 And if you’re a pickleball fan, there are now four courts on which to play. 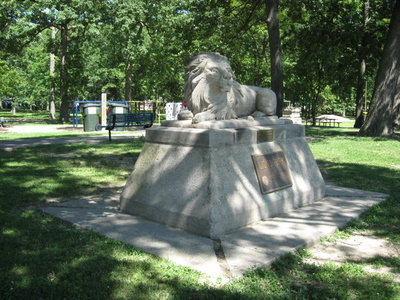 Lions Park is one of the many great places to play and relax in Fort Wayne. For more information on this and all of Fort Wayne’s parks, including special events held all over the city, check out www.fortwayneparks.org.